A mix of maintenance strategies is often your best bet for an efficient facility. It’s difficult to mix and match maintenance strategies without already having a system in place, though. Rather than being at the mercy of unanticipated breakdowns, a computerized maintenance system allows you set the PM schedule for your assets and decide where it makes sense to strategically use reactive maintenance. By analyzing asset failures, downtime, resource utilization, and spending patterns in the CMMS, you can implement changes that will add value or reduce risk, which will improve your bottom line. Tracking the right maintenance metrics and KPIs also gives you better visibility on where to focus your efforts, and can help identify chronic equipment problems, benchmark against industry standards, and identify best practices. Managing your inventory with a CMMS helps your organization automatically track parts, manage suppliers and vendors, and optimize inventory levels. If stock falls below a set minimum, the system will notify the required users or suppliers to start the re-ordering process. While some degree of maintenance backlog is unavoidable, a CMMS can help balance resources and maintenance costs so that it doesn’t spiral out of control. It also helps capture smaller fixes that would have otherwise gone unnoticed, which helps avoid bigger problems later on. A CMMS keeps you up-to-date on your organization’s maintenance activities. The software lets you store and attach procedures, error logs, manuals, permits, licenses, photos, images, diagrams, and schematics to the asset record. This lets users access important information when they need it most, speeding up troubleshooting and work order processing times. Scrap and rework happens when production systems break down. If the product is left sitting for an extended period while technicians scramble to fix the issue, it may need to be pulled from the production line. The defective product is either scrapped or reworked through the system, which requires energy and generates waste. The easiest way to mitigate emergency breakdowns is performing proactive maintenance on your systems, and tracking everything in your CMMS. Many organizations lack an efficient process for dealing with work requests. Maintenance managers still receive work requests via phone, sticky notes, or just by word of mouth. They’re expected to remember what the issue is, where it is, which system it’s a part of, and who requested it. CMMS software can automate this process to ensure nothing is forgotten. It lets employees log work requests directly to the maintenance queue through the CMMS guest portal. This way, nobody wastes time trying to track down maintenance personnel to get an update—the CMMS automates all this through work order updates—so the maintenance manager and their team can focus on the job at hand without interruption. Over time, the machines in your facility will require more care. Having all of the machine’s historical data and documentation (i.e. manuals) stored in a CMMS makes the maintenance of aging assets much easier. A CMMS doesn’t just manage the wellbeing of your machines—it also allows you to store and track health and safety information for the people working in your facility. The software can facilitate inspection rounds, act as a central repository for checklists, material safety data sheet (MSDS) information and safety procedures, and keep track of technician certification. A CMMS can have all the features technicians needs to complete work orders, but if it’s not mobile, it provides little value for the people that will be using it in their day-to-day work. Thankfully, most modern maintenance management solutions do come with a corresponding mobile CMMS app. With an app, technicians can access the software in the field, close work orders, and receive push notifications as new work comes up. This gives maintenance managers better oversight on the comings and goings of their team during the day and allows technicians to log their work without having to run back to the main office. It’s really hard to manage an asset through its entire lifecycle if a good portion of its history is stored in the memory of a technician; That technician could leave for a different job, retire, or simply forget some details. Couple that with an aging workforce and high turnover, and you have a recipe for organizational information loss. One of the big benefits of a CMMS is that it can help you avoid this. Each asset has its own unique record that details the PM schedule, repairs that have been completed, parts used, labor hours spent, and so on. Technicians can quickly access asset records, old work orders, previous repair information or replacement part histories to assist with troubleshooting the issue at hand. If you keep machines and systems running efficiently, they will use less energy. Today, the manufacturing industry is responsible for 35% of global energy use. Greater demand for energy in the future could lead to energy shortages that impact everyone, so it’s in everyone’s best interests to reduce energy use. Adhering to maintenance schedules and keeping systems in like-new condition ensures equipment is operating as efficiently as possible, limiting the impact equipment and facility assets have on the environment. When you standardize organizational processes, quality and reliability increase, while variation and cost decrease. A CMMS lets you set up checklists and workflows to help you standardize and document best practices, and ensure everyone performs the same job the same way every time. A CMMS ensures everyone is working from the same system, using the same procedures, following the same best practices, and staying safe in the process. The purpose of preventive maintenance (PM) is to schedule inspections and maintenance so that defects can be spotted before they become a problem. This reduces unplanned breakdowns and cuts down on time spent on reactive maintenance. CMMS software lets you get on top of maintenance and establish a PM program by activating planned tasks based on a number of fixed or floating triggers like time, meter, or event. Once the system is set up, work orders will be generated based on schedules you’ve set, along with all the information required to complete the work order quickly and easily. Maintenance management software tracks parts, labour, service history and other miscellaneous expenses when a maintenance work order is completed. This makes it easy to run costing reports to see where the budget was spent, identify areas that are running over budget, and make educated decisions about whether a piece of equipment should be repaired or replaced. You can also filter data to show the costs of reactive maintenance versus planned maintenance, which highlights the effectiveness of the current asset management strategy and whether or not it can be improved. 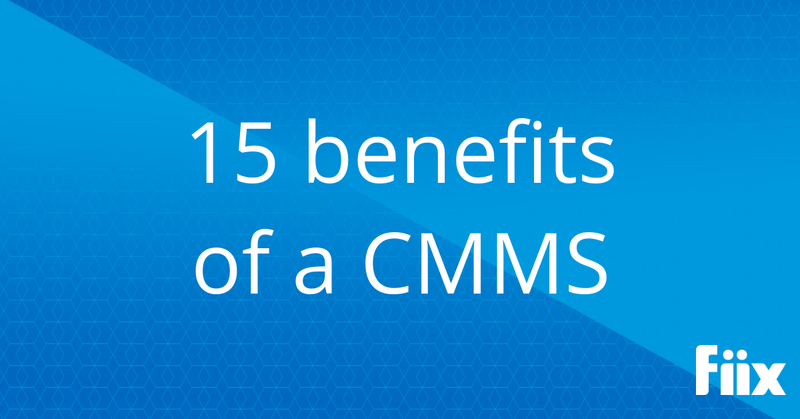 Want to take a deeper dive into more CMMS benefits? Check out our e-book to see how maintenance management software can help improve proactive maintenance, productivity, compliance, and accountability where you work.